By all rights, the series squeezed from that grand sci-fi thriller, “Planet of the Apes,” should he shedding hair all over the place by now. 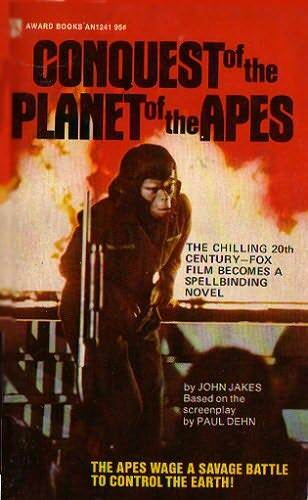 Number Four, “Conquest of the Planet of the Apes,” arrived yesterday. It’s not bad, as apes and 20th Century-Fox go, at least hand in hand. There’s the plot, with a talking chimpanzee befriended by a circus owner and finally leading a swarm of enslaved hairy-clad pals in revolt in a futuristic world of icy-veined humans. The series’ writer, Paul Dehn, nimbly continues the story from the predecessor, weaving in just enough crisp philosophizing on both sides to command attention. Furthermore, J. Lee Thompson’s direction furiously propels the action in a compact chromium-and-glass setting—and wait till you see that last battle royal. Don Murray, Hari Rhodes and Ricardo Montalban do well on the erring human side. But yesterday’s audience at the New Embassy cheered the perservering apes and so did I. At ’em, boys!